Hello, Gorgeous! : calling all students! I absolutely love lists. LOVE. So, when I found this one by Subtly Fabulous, I just couldn't resist hooking you guys up. 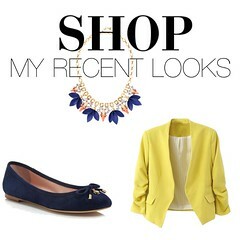 So, check out her blog, and for the love of discounts, use this amazing list! 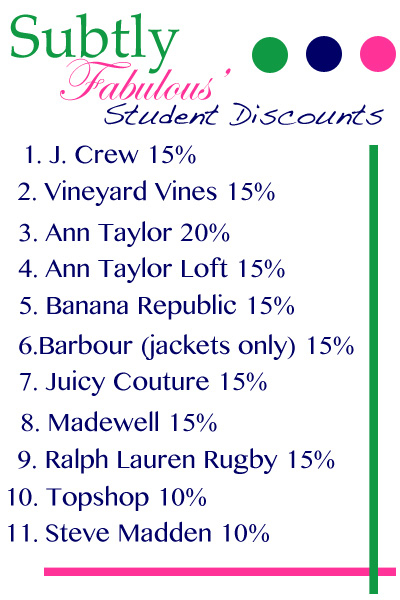 Yep I make sure to use my students discount at Jcrew...best part they add it to the sale discounts!!! I didn't know Steve Madden had a student discount!! Thanks for that tip!! Oh man, I want to live in the US too ! Too bad I'm not a student! But I get a military discount at Old Navy!! Thanks so much for including my blog here! I always appreciate it! Don't forget The Limited! 15% there too.